She had begged her mother, a figure skating coach, to teach her to skate, but at age three, Mary Grace Kelley was deemed too young. Her older brother, Tommy, had already begun learning the year prior when he was four years old. Like small siblings do, Mary Grace looked up to him and wanted to keep up as best as she could. He offered to help in the way he knew how. They headed over to Boston College where Mary Jean held her classes. It was a February holiday on a Monday, and an hour and a half after the pair took the ice, Mary Grace was skating on her own with her brother. For three years, the two of them were in figure skates. Tommy had a black pair that he mistook for hockey skates until the rink’s Zamboni driver asked him when his mother would “get him out of these figure skates.” He threw Mary Jean a panicked look. She switched him over to hockey the next week, and since she herself figure skated, she thought her daughter might want to as well. But, again, like her brother, Mary Grace craved a pair of hockey skates, too. 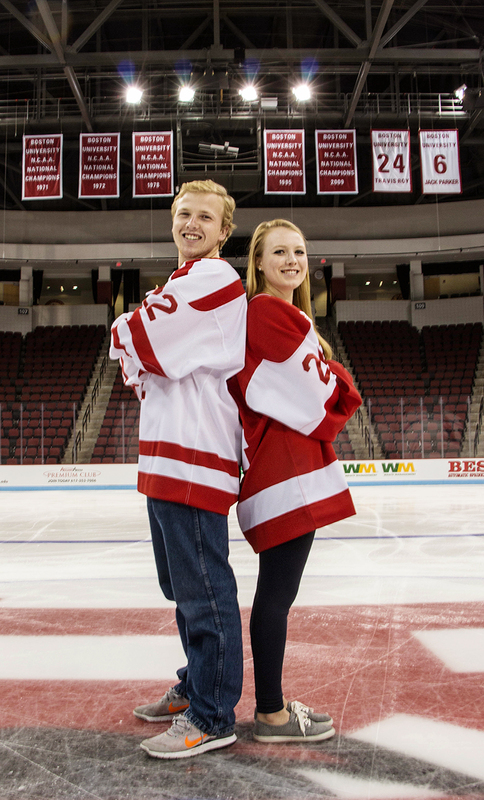 The two were incredibly close growing up, as they had no other siblings, and are even closer now that they’re both at BU playing for the men’s and women’s ice hockey teams as junior and freshman forwards. But they had their squabbles, like brothers and sisters do. He’d spend hours on Legos, and she’d come around the corner with a bat and wreck them. They’d be playing knee hockey, and he’d get her in the nose and urge her not to cry so their mom wouldn’t find out. The long living room in their Natick house lent itself to countless knee hockey games, and the driveway was perfect for shooting pucks. The two would spend hours outside working on their shots, long enough for their mother to have to call them back in. The basement was filled with a sporting goods store’s worth of equipment. Baseball bats, baseball gloves, lacrosse sticks, everything. You name it, they had it, Tommy said. For just hockey alone, though, close to 70 sticks line the walls in the room. They’re mostly broken or not used anymore, but they stay there. One side was reserved for Tommy’s gear, whether it was old or new, hung up on a shelf. Mary Grace’s things were on the other side, spread out all over the place, according to her brother. 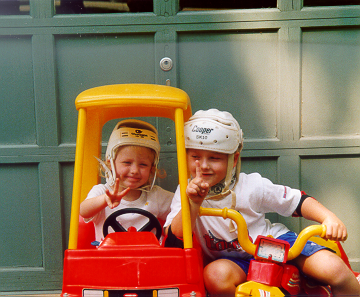 They grew up with hockey always on the television and places they could always go to play. He didn’t always get to her games, but she would be at his. Part of the reason the two look so similar on the ice, Mary Grace said, is because she would watch what Tommy would do and try to put that into her game. Her brother added that he’d point different things out to her that he noticed and that the two watched the same players growing up and ended up adopting the same style of play. “They are so close, and big brother is always telling her what she has to do,” Mary Jean said. “‘You gotta get stronger, you have to do this, work on your shot,’ and she listens to every single word. “When they were smaller, I think if Tommy criticized her she didn’t like it, but now she takes everything and does whatever he says,” she added. During the women’s team’s exhibition win over the University of Guelph on Sept. 26, Tommy said senior forward Dakota Woodworth’s father came up to him between periods and told him how much Mary Grace looked like her brother on the ice. Tommy and Woodworth had been teammates when they were 10 years old. They look pretty similar off the ice as well, with matching heads of white-blond hair and bright smiles. Mary Grace said she’s even inherited Tommy’s nickname. Ever since this summer when some of the other athletes or older kids on her team found out she was his little sister, they’ve been calling her Little TK. And they’re similar in their work ethic, too. “It’s amazing how hard they both work,” Mary Jean said. “They will never give up. They will persevere, and it’s their passion. Tommy started his hockey career at age six, a couple years after he learned how to skate. He played for the Natick Comets first before moving onto the Minuteman Flames, followed by the South Shore Kings and then Top Gun Youth Hockey. Most recently, he was co-captain of the varsity hockey team at St. Sebastian’s School for his 2012-13 senior season in which he finished second in scoring on the team. During Tommy’s junior year, only senior assistant captain and then-teammate Danny O’Regan had more points than him. It was during his senior campaign that he attracted the attention of former head coach Jack Parker and former associate head coach Mike Bavis. In an All-Star game he had made for his fall prep league, Tommy impressed on the ice so much that Bavis wanted to talk to him postgame about playing for the Terriers. In deciding to come to BU, Tommy would be reunited with O’Regan and have the chance to play in the Beanpot, something Mary Jean said meant a lot to him. With Tommy and Mary Grace having conflicting game schedules throughout their adolescences, Mary Jean said she would end up going to Mary Grace’s games while her husband, Tom, would attend Tommy’s. But when Tommy was named co-captain of his team at St. Sebastian’s, Mary Jean had to help run the snack bar at games, as it was the job of the captains’ parents to do so. Mary Grace helped guide her team at Dexter Southfield School to the New England Preparatory School Athletic Council title game last season and finish as runners up. She also was named to the New England All-Scholastic team and was tabbed a Division II First-Team All-Star. Before her time with Southfield hockey, the forward played 10 years with Assabet Valley and won a Tier I National Championship as a member of the team in 2012. Mary Grace’s first team was also the Natick Comets, though she and her brother never played together. She committed to BU on the later side like Tommy as well. Mary Grace toured the school in the spring of 2014, but didn’t commit until the fall, though Mary Jean said her daughter knew almost immediately after her recruiting visit she wanted to come to Commonwealth Avenue. Besides the fact that Tommy was already at school, Mary Grace said she loved the campus and the city, while her mother said head coach Brian Durocher played a part as well. And BU runs in the family for Tommy and Mary Grace, at least on their mother’s side. Though both of their parents attended Boston College, all three of Mary Jean’s older brothers went to BU. Her oldest brother, Jim Connors, actually skated for the Terriers and won a national championship with the team in 1972. When Tommy was born, even, his uncles gave him a small BU wooden hockey stick that he would use to push a puck around the floor with as soon as he could walk. It might have been destiny then that the two wound up at BU, Mary Jean said, where they see each other fairly often around campus, almost every day and mostly in passing in the dining hall. For both of them it’s nice to see the other, whether it’s briefly or if their mom comes to visit and bring them something from home. Their parents are certainly happy they’re at BU as well, close to home and together. “He’s so happy, so far so good, and she’s so happy, and as a parent, that’s all you want,” Mary Jean said. “You want your kids to be happy, and right now they couldn’t be happier, and we couldn’t be either. Mary Jean said she was already trying to plan how to make it to each one of their games this season, revealing a tentative and travel-intensive plot to be able to see each of their games Thanksgiving weekend. Mary Grace and the women’s team have a tournament game in Vermont at 1:00 p.m. against Cornell University on Nov. 28, the same day Tommy and the men’s team play Red Hot Hockey at Madison Square Garden against the Big Red at 8:00 p.m. Then the next day, Mary Grace has a second tournament game vs. Ohio State University at 1:00 p.m. again. If Mary Jean and Tom drive to Vermont for the first game, they can drive to the Burlington Airport and fly into LaGuardia using Tom’s Delta miles to see Tommy. Then they can stay the night in New York before heading back to Vermont to catch Mary Grace’s second game.